I work in The Quarter, my new boss's computer went down. I called Evolve, I personally have used them in the past. I impressed my boss. Nuff said. Amazing place, very friendly staff, will definitely be back! HIGHLY recommended!!!!! Louisiana is a statelocated in the southern region of the United States. Louisiana is the 31st most extensive and the 25th most populous of the 50 United States. Its capital is Baton Rouge and largest city is New Orleans. Louisiana is the only state in the U.S. with political subdivisions termed parishes, which are local governments equivalent to counties. The largest parish by population is East Baton Rouge Parish, and the largest by land area is Plaquemines. Much of the state's lands were formed from sediment washed down the Mississippi River, leaving enormous deltas and vast areas of coastal marsh and swamp. The two "Deltas" are located in Monroe, the parish seat of Ouachita Parish, Shreveport, the parish seat of Caddo Parish, and Alexandria, the parish seat of Rapides Parish, for the small Delta, and Monroe, Lake Charles, and New Orleans for the large Delta. They are referred to as Deltas because they form a perfect triangle shape when the points are lined up. These contain a rich southern biota; typical examples include birds such as ibis and egrets. There are also many species of tree frogs, and fish such as sturgeon and paddlefish. In more elevated areas, fire is a natural process in the landscape, and has produced extensive areas of longleaf pine forest and wet savannas. These support an exceptionally large number of plant species, including many species of orchids and carnivorous plants. Louisiana is home to many, especially notable are the distinct culture of the Creoles. 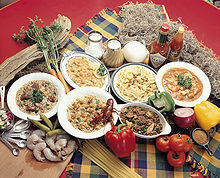 Creole culture is an amalgamation that takes a little from the French, Spanish, African, and Native American cultures. Creole comes from the Portuguese word crioulo, meaning a person of European (specifically French) descent born in the New World. The oldest Louisiana manuscript to use the word Creole, from 1782, applied it to a slave. Today, those descended from both slaves and freemen, French, Spanish, and Native Americans identify as Creole. Creoles became associated with the New Orleans area. Most wealthy Creole planters had houses in town as well as at their plantations. All of the respective groups that settled in southern Louisiana have combined to make one "New Orleans" culture. It has continued as one of the dominant social, economic and political cultures of Louisiana, well into the 20th century. The ancestors of Cajuns came from west central France to the provinces of New Brunswick and Nova Scotia, Canada, known as Acadia. When the British won the French and Indian War, the British forcibly separated families and evicted them because of their long-stated political neutrality. Most captured Acadians were placed in internment camps in England and the New England colonies for 10 to 30 years. Many of those who escaped the British remained in French Canada. Once freed by England, many scattered, some to France, Canada, Mexico, or the Falkland Islands. The majority found refuge in south Louisiana centered in the region around Lafayette and the LaFourche Bayou country. Until the 1970s, Cajuns were often considered lower-class citizens, with the term "Cajun" being somewhat derogatory.